Soo Thunderbirds are perched atop the West Division of the Northern Ontario Jr. Hockey League heading into a home and home set with the Blind River Beavers later this week. The Thunderbirds have a record of 15-5-0 through 20 outings while the Beavers are in third spot with a record of 12-8-3 in 23 starts. Veteran junior hockey forward Lucas Theriault leads all Thunderbird scorers with 14 goals, 14 assists, 28 points. Noah Boman is second on the Thunderbird scoring chart with 9-18-27 totals followed by fellow forward Nick Smith with 11-9-20 numbers and defenseman Steve Bellini with a 4-16-20 count. Forward Tyler Malpass is next with 7 goals, 8 assists, 15 points. Top rookie scorer for the Thunderbirds is forward Avery Rebek, who has 5 goals, 6 assists, 11 points. The Thunderbirds are home to Blind River on Thursday night before making the trek to the Milltown to play the Beavers on Saturday evening. 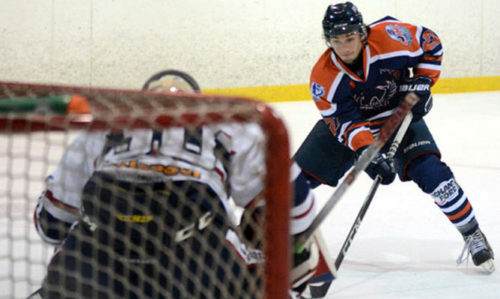 Homegrown forward Caleb Serre leads Blind River in scoring with 12 goals, 20 assists, 32 points.